The ISI Group has been doing some great research on China's economy - the work is often better than what comes out of the large dealer research departments. Last night we saw the latest result from the MNI business survey. 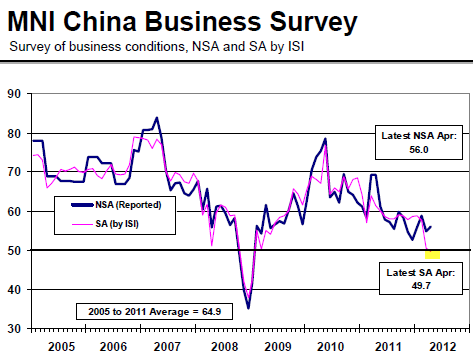 MNI (attached): -­ Overall Chinese business conditions showed a slight improvement in April as new orders rose but a price squeeze and renewed credit tightening left a decidedly mixed result for the MNI China Business Sentiment Indicator. The overall current business conditions index rose after falling last month, hitting 56.04 in April after 54.81 in March and 58.87 in February. It was at 69.20 a year ago. The result was up from 55.40 in the flash survey a week ago. ISI however looked beyond the headline numbers to make a seasonal adjustment, properly incorporating the Lunar New Year holidays. The seasonally adjusted MNI number is 49.7, down for a third consecutive month. China's economy is slowing down. Also behind the headline numbers are some indications of increasing margin pressures on Chinese businesses (as Chovanec pointed out last week). MNI: The biggest surprise in the survey was the result for the index of current input prices, which rose to 84.48 in April, the highest result in the survey's more than six-­year history, from 72.28. That result indicates that a majority of the companies surveyed were paying higher prices, a trend backed up by comments from some of the companies themselves. "The cost of cotton has risen a lot and the whole industry is suffering," said an official at a textile company. "It's not easy to make even little profit." Other industries are also seeing higher prices. "Our prices received are falling while raw material costs are rising," said an official at a machinery maker. Indeed, the April result saw a sharply divergent trend for prices, with the prices received index dipping back under the 50 level which separates growth or expansion from contraction. The index was at 46.71 in April from 50.00 in March and 54.11 in February. "The whole industry is facing the serious problem of over capacity, and we have had to lower our prices," said an official at a chemical company. "We don't have an optimistic outlook for the future;; things could get worse."